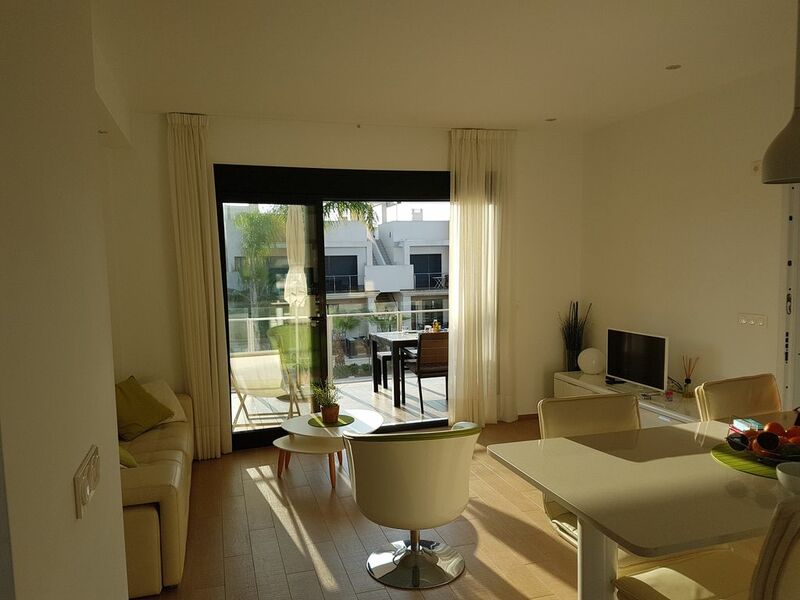 Spacious 2 bedroom, 2 bathroom apartment for rent in La Zenia, Spain (82,50m²). From the south-east facing terrace look out on the tropical Balinese-style pool. It includes two mirrored pools with different levels, the pool is lined with vegetation between which ligpontons are to enjoy blissful. The apartment is equipped with all the necessities to by a carefree holiday spend. All rooms have air conditioning (cold / hot). There is a well equipped kitchen that has all the necessary appliances: dishwasher, washing machine also an iron and board are provided. There are also plenty of towels and bath towels and bed linen provided. The apartment is on the first floor and is accessed by stairs but also accessible via a lift. It is part of a private urbanization with 100 other homes in different types and the fully enclosed with a gate. The domain has the necessary number of parking places where parking is free. La Zenia Beach is a mile from the sea, which is easily accessible on foot, + -15min. Even with the car there are several beaches in the vicinity. For golf enthusiasts, it is the ideal base, several fields in the area. The master bedroom has direct access to the bathroom, the second bedroom must first pass through the living room to have access to the private bathroom. We look forward to welcome you again in the future. Beautiful apartment... 2nd time we've been..it won't be the last! This is the 2nd time we've stayed here. It really is a beautiful, modern apartment and complex. Very safe, well thought out, with lots of personal touches that make it stand out from other rentals. Everything you could want is on the doorstep. With the apartment itself... efficient air conditioning.. a huge comfy bed, double balcony looking onto the pool area.. lovely powerful showers... can't praise it enough. Dimi and Tessa are keen to check all is ok during the stay. We'll definitely return! Thanks Alison for the lovely review! The apartment was beautiful, very modern and spotlessly clean, communication from the owners was lovely. The air conditioning was the most efficient we've ever come across and the furniture and furnishings were of very high standard. Extra touches that made it very special were towels available for the pool or beach, and having the use of sun loungers / parasol to use again by the pool and beach - what a lovely idea. Loved the fact that herbs / spices were left in the kitchen (so annoying when you have to buy everything new). We know the area quite well and this property is ideally placed, couple minutes walk to the mall at La Zenia with countless shops and places to eat out, roughly 10 minutes walk to 2 beautiful blue flag beaches, and lots of eating complexes within 20-25 mins walk. Do be aware the bathroom has glass doors, was fine for us but may not be everyone's cup of tea. But I can't recommend this highly enough, the pictures really don't do it justice and we will definitely be back! Dimitri´s and Tessa´s place is very comfortable and has everything you need for your holiday. Its the perfect location in La Zenia and the apartment itself is beautifully arranged with everything you might need. The ideal base for a carefree holiday, several beaches in the vicinity. La Zenia beach is within walking distance. Torrevieja (7km) a handsome seaside resort especially for the Spaniards is very popular around the harbor really pleasant to be there, walking along the pier or on the dike with plenty of restaurants and bars. Torrevieja is also known for its salina's two huge salt lakes located just behind the city and used to be the hub of the economy. Here you can flamingos here in the breeding season by up to 2,000 lots perches. Cartagena: Looking for culture? Then Cartagena definitely worth visiting, (50 km) it is a historic Roman town with the largest natural harbor in Spain. Cartagena is nestled between the mountains and castles. Murcia also known as the Madrid of the South is architecturally definitely worth visiting and is a 65 km from La Zenia, Murcia also has an airport. !! Niet in de prijs inbegrepen is de verplichte eindschoonmaak van 75€ te betalen op locatie !! !! Not included in the price is the obligated house cleaning of 75€ to be paid on location !! We heten je welkom in La Zenia Beach & hopen dat u een een prachtige vakantie beleefd in ons appartement mocht er echter toch een probleem zijn van om het even welke aard aarzel niet om ons te contacteren. Wij doen onze uiterste best om het zo snel mogelijk op te lossen. Heeft u echter schade of iets dergelijks vragen wij u ook om zo vriendelijk te zijn om ons hierover in te lichten. Hello, We love to welcome you in La Zenia Beach & hope you have a wonderfull holiday in our apartment. Don't hesitate to contact us if you have any question or concern. Once you fullfilled the payment you ll recieve all the info about the keytransfer, adres, etc.. Enjoy your stay ! !